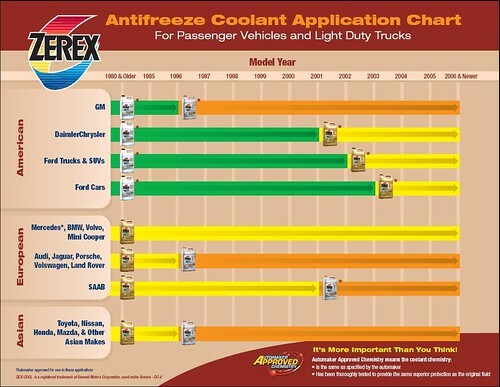 Which color coolant is best? How about purple? If you live in a cold climate, just be sure you have adequate protection. We've seen some bad things happen to water pumps fins when they are used as an ice crusher. Use what your budget can cover. Just use something. I think Xerex has an Asian car pre-mix that is red. I have it running in my late model Hondas. I actually prefer Xerex G05 mixed with distilled water and a bottle of water wetter. I never use tap water. According to the following chart, G05 is recommended for older Asian vehicles. My Nissan and Infiniti vehicles are old. I wouldnt use Prestone green. This is what I think caused corrosion in the coolant system in my car. The radiator had to be replaced and the coolant bypass pipes had pitting that almost are through. Last edited by maximatech12; 06-10-2017 at 09:14 AM. Whatever you use, make sure it's labeled as being free of silicates and borates. Silicates can damage water pump seals and borates will cause aluminum corrosion/pitting. Please report back, that's what I'm using in my car! Here's an interesting post from Bob's on the different formulas. I subscribe to performing a system flush with distilled water and coolant change every 2 years. Last edited by CS_AR; 06-16-2017 at 07:00 AM. "It's really not all that complicated. There are basically only three types of antifreeze used in the US and sold at retail, and all three are ethylene glycol based: Traditional Green which uses inorganic (silicate) anti-corrosion additives. DexCool, which uses OAT (organic acid technology) anti-corrosion additves. And G-05, which is HOAT (hybrid organic acid technology). G-05 is a low silicate formula that uses OAT additives that are different from DexCool, hence the two coolants are not compatible. The Japanese coolants (like Toyota red) are OAT and are silicate and phosphate free. But as with G-05, the OATs used are not the same as DexCool, hence no compatibility." OAT may be just a sales pitch. Half of whats in harmful anti-freeze is may already be organic. It may be silicates that damage the piping. I've heard borates cause pitting. Eats at Heater core, bypass and oil cooler piping. Plugs up radiator fins but I don't think it eats at the aluminum! Just may build up on the surface! Eats away at steel. NJ Nj 2003 maxima gle for sale! Quick Reply: Which color coolant is best?